There's no one perfect way to make rice. 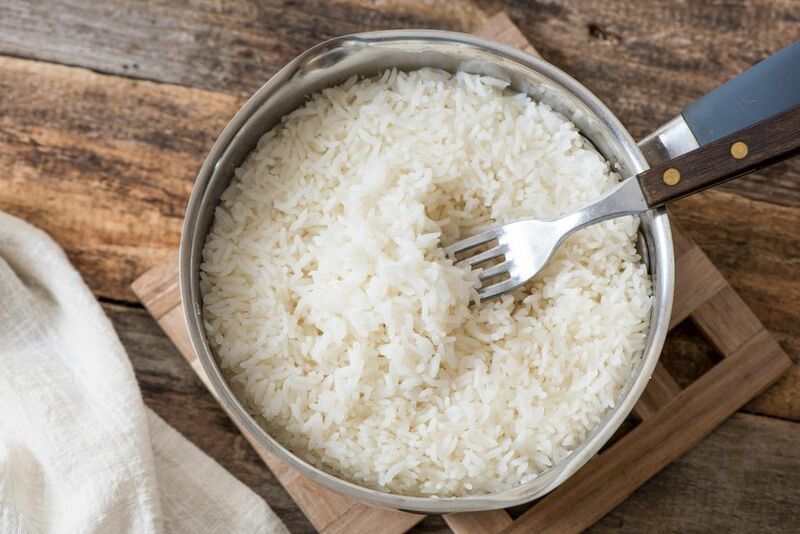 Rather than the method used—stove, oven, or rice-cooker—it's more important to use the correct ratio of rice to liquid, which will vary based on the method, and to prep the rice properly by rinsing it in cold water to remove starch. Choose the cooking method based on what's best for you. If you don't want to turn on the oven and heat up the house, use a rice cooker or stove. If you need an extra burner for other dishes, the oven or rice cooker frees up space. Start with 1 cup of uncooked white rice. This will be enough for four regular servings of rice. Rinse the rice with cold water until the water is clear. Rinsing the rice is optional, but it's how to make the rice less gooey. In a medium saucepan with a heavy bottom and a tight-fitting lid, combine the rice and 1 3/4 cups of liquid, either water or stock. If using just water, add 1/2 teaspoon of Kosher salt. Give it one good stir to separate clumps. Bring the contents to a boil, cover the rice, and turn down the heat to the lowest setting to cook for 18 minutes. Remove the pot from the heat and let it sit for 5 minutes. Fluff the rice with a fork to release the steam. This is actually important because the built-up steam can continue cooking the rice and cause it to get too soft. Tips: Don't uncover the rice during cooking. If it's done before you're ready to serve and you're worried it will get mushy or gooey, lift the lid, place a folded dish towel over the top, and replace the lid. The towel will soak up excess condensation to prevent mushiness. Preheat the oven to 375 degrees. Rinse the rice with cold water until the water is clear. Combine 1 cup of long-grain rice and 2 cups of liquid in an oven-proof pot with a tight-fitting lid. Add 1 tablespoon butter, salt, and pepper. With the lid on, place the dish into the preheated oven and cook for 45 to 60 minutes. About halfway through, remove the dish from the oven and stir once. Remove the dish from the oven and let the rice sit with the lid on for 5 minutes. Remove the lid and fluff the rice. Rinse 1 cup of rice with cold water until the water is clear. Combine the rinsed rice and 1 cup of water in the rice cooker and add 1/2 teaspoon salt. If you're using salted stock, you can skip the salt. Turn on the rice cooker and set it for the proper amount of time in accordance to the machine's manual. Let the rice sit for 10 to 15 minutes after the rice cooker automatically shuts off. Tips: Get to know your rice cooker by reviewing the manual before using it. Double-check the instructions to ensure that you're using the machine properly. How to make rice less gooey or mushy: Rinsing the rice before cooking removes the starch and makes it less mushy. If you forgot this step, put the uncovered pot over low heat or spread it out on a baking sheet to dry it out in a low oven. The rice is still hard: Add 1/4 cup of water and cook it, lid on, on very low heat for 5 more minutes. The bottom layer burned: If the rice is totally black on the bottom and the burnt taste has permeated the whole batch, it's a goner. If it's just a little toasty, pour in some hot water to loosen the grains and serve it anyway—the crunch will provide a nice contrast.